Our next screening at Coast is 'THE LOOK OF SILENCE'. 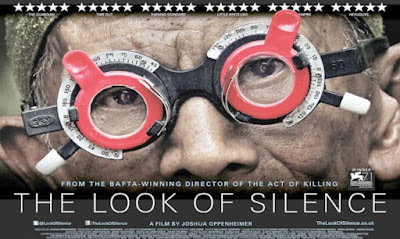 Joshua Oppenheimer's superb companion piece to the equally outstanding and groundbreaking 'THE ACT OF KILLING'. Monday the 12th of February, doors at 7.30pm, film at 8pm. A middle-aged Indonesian man, whose brother was brutally murdered in the 1965 purge of communists, confronts the men who carried out the killings. Out of concern for his safety, the man is not fully identified in the film and is credited only as "anonymous," as are many of the film's crew positions. Some shots consist of the man watching (what seems to be) extra footage from The Act of Killing, which includes video of the men who killed his brother. He visits some of the killers and their collaborators—including his uncle—under the pretense of an eye exam. Co-produced by award winning maverick Werner Herzog with Errol Harris, this film is a must-see documentary of singular clarity and brutal honesty. To become a member of the Worthing Film CLub, please contact one of our team at any screening, or email us on worthingfilmcub@gmail.com. Membership costs £25 per year and allows you free entry to all our 12 monthly screenings. Nine of which will be held at Coast cafe and the other 3 at Connaught Studio Cinema. You also have access to our extensive DVD library. Please note there are no reduced prices for guests of members and all non members tickets will be £4 at Coast and £7 at the Studio.